Yes its true. We were banned. We fought back. And we won. We want to thank all our supporters who supported us on social media and the mainstream media. This was your victory. They say the people united can never be defeated. Today progressives proved their strength through their unity. They forced the authorities to retreat from the ban. This may be a very small victory in relation to all the problems that Pakistan faces today. But a victory nonetheless. Let us take confidence from this victory and continue our work to unban the other progressive pages that continue to suffer from censorship. And struggle for a progressive Pakistan. The struggle continues. Facebook said on Friday that it had blocked users in Pakistan from access to the pages of a popular Pakistani rock band and several left-wing political pages, drawing sharp criticism from free-speech activists who accused the American company of caving in to government censors. Members of the band, Laal, whose members have frequently spoken out against the Taliban, confirmed that their Facebook page, which had over 400,000 “likes,” had been blocked. Following an outcry on social media and inquiries by reporters to the Pakistani government and to Facebook, the government reversed itself and Facebook restored access to Laal’s page. But advocates said late on Friday that at least six other Facebook pages that promoted progressive debate in Pakistan and that had been blocked during the week remained inaccessible. A spokeswoman for Facebook in London said the company’s policy was to adhere to local laws, and that it blocked the pages after receiving an official request from the Pakistan Telecommunications Authority, which regulates Internet content in Pakistan. There you have it folks. Facebook is a hapless company that is forced to please authorities everywhere. So while Laal's ban has been reversed, there are other pages that are still inaccessible in Pakistan. So here is a direct petition to Pakistan Telecommunication Authority to lift their bans as well. Laal made this video in Afghanistan. We salute the bravery and fortitude of our nations against the gravest and most unyielding of odds. Let us re-build the broken bridges and heal old wounds for we are bound together by the memory of countless centuries. Let us strive forward together, for ours is the same struggle, the same fight. Against all those who seek to oppress and enslave us. And against tyranny everywhere. By the way, there is a local connection as well. 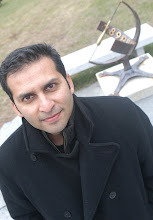 The former lead vocalist for Laal, Shahram Azhar, is currently pursuing his doctorate in economics from UMass-Amherst. I haven't had a chance to run into him yet, but I hope to dod so before he leaves the area.